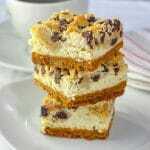 Chocolate Chip Cookie Dough Cheesecake Bars - The holy grail of cookie bars for cheesecake and cookie dough lovers alike. Mix together the graham crumbs, melted butter and sugar. Press firmly into the bottom of a greased or parchment paper lined 9x9 inch baking pan. Bake for 5 minutes at 325 degrees F.
Cream together the cream cheese and sugar very well. Add the egg and vanilla and mix until well blended. Spread evenly over the graham crumb crust. Cream together the butter, white sugar, brown sugar and vanilla extract very well. Mix together the flour and salt and add to the creamed mixture. Fold in just until a dough forms then mix in the chocolate chips. Pick up the cookie dough in handfuls and press into a ball. Break off small nuggets of the dough and sprinkle these evenly over the cheesecake layer. Bake at 325 degrees F for 30-35 minutes or until the cookie dough just begins to brown on top. Cool completely in the pan before cutting into squares or bars. Store in an airtight container in the fridge if you are not freezing these cookie bars.